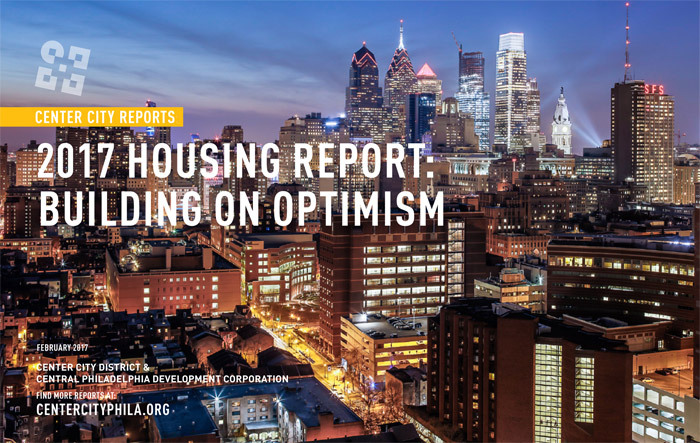 The Center City District (CCD) and Central Philadelphia Development Corporation (CPDC) have released 2017 Housing Report: Building on Optimism, examining downtown's burgeoning residential market. In 2016, a record number of new residential units were brought to market for a growing downtown population, with 2,506 new units delivered in Greater Center City, a 15.5% increase over the previous high of 2,168. Of these, 73% (1,833 units) were rental apartments and 27% (673 units) were for-sale housing. Six large projects of 100 units or more account for 73% of all new apartments (1,331 units) completed in 2016. At the same time, 528 single-family homes and smaller multi-family developments spread across the neighborhoods that extend beyond the downtown core, north to Girard Avenue and south to Tasker Street. Center City is benefitting from a national trend of shifting away from home ownership toward rentals, while shrinking household size also fuels demand for apartments. Density, walkability and convenient access to restaurants, retail, culture, and medical care are appealing to all ages and, particularly, to young adults and empty nesters. The fundamentals of the homeownership market likely will remain very strong, but some excess supply of new rental units coming in 2017 could cause rents to moderate and vacancy rates to rise in some existing apartment buildings. To get the full report, Click Here.